In case you were worried about the state of JRPGs on the Nintendo 3DS, Atlus just announced not one but three new games coming to the console in late 2017/early 2018—Etrian Odyssey V: Beyond the Myth, Radiant Historia: Perfect Chronology, and Shin Megami Tensei: Strange Journey Redux. 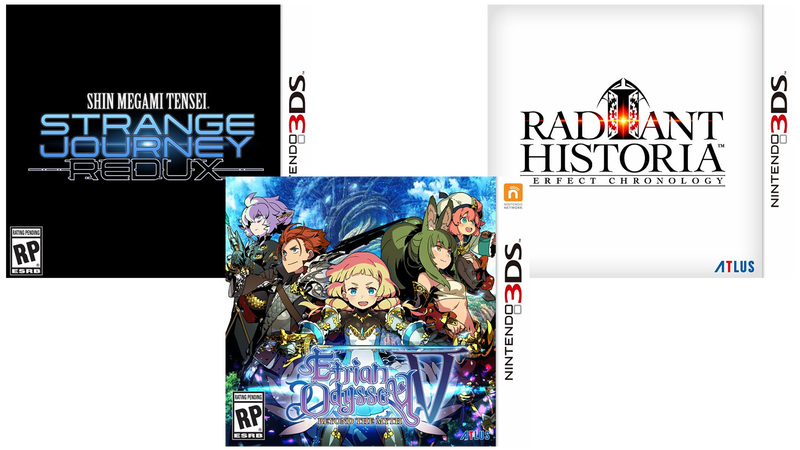 The fifth main installment of the Etrian Odyssey series is joined by remakes of excellent DS titles Radiant Historia and Shin Megami Tensei: Strange Journey. Both “expanded ports” contain additional story content and updated presentation elements. Etrian Odyssey V: Beyond the Myth is due out this fall, with the two updated games slated for early 2018. Gotta pace ourselves. Here are the official descriptions for each game, via Atlus press release. Radiant Historia: Perfect Chronology - It’s been six years since Radiant Historia was released on Nintendo DS in 2011, but it’s time to return to Vainqueur and unlock the time traveling power of the White Chronicle once again in Radiant Historia: Perfect Chronology. This beloved classic is an expanded Nintendo 3DS port of the original game that will contain a great deal of added gameplay/story content, updated presentation, and new ways to experience the adventure! Shin Megami Tensei: Strange Journey Redux - A spatial distortion full of demons appeared in Antarctica, threatening to engulf the Earth in Shin Megami Tensei: Strange Journey. The United Nations responded by tasking a team of highly advanced specialists with piercing the anomaly and figuring out how to stop it from the source. Well, get ready to don your Demonica once again in this new expanded port: Shin Megami Tensei: Strange Journey Redux. Expect new story content, additional endings, a new dungeon to explore, and more in the return of this sci-fi tinged SMT adventure.